Plus, know who’s the richest congressman and why World Bank revises downward global growth forecast for 2016. 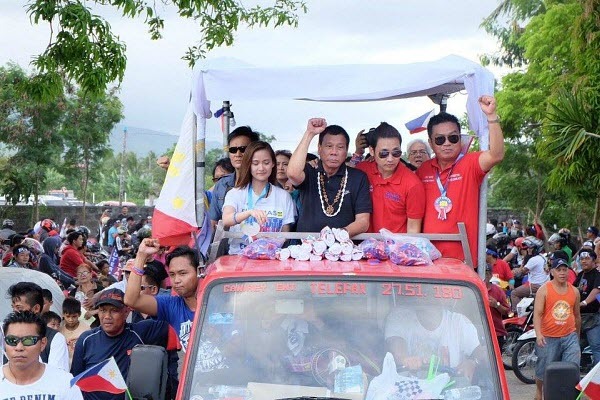 President-elect Rodrigo Duterte spent a total of P371.46 million ($8.06 million) for his campaign, as reported on his Statement of Contributions and Expenditures (SOCE), filed on Wednesday, June 8. The statement showed he did not spend all of the contributions given to him, as it totaled to P375 million ($8.17 million). Personal funds worth P200,000 ($4,359.29) were also spent during the campaign. His running mate, Senator Alan Peter Cayetano was the biggest contributor, donating P71.2 million ($1.55 million) worth of tandem advertisements. However, it showed that his political party, PDP-Laban, did not shell out any cash or in-kind contributions during the campaign. Meanwhile, Vice President-elect Leni Robredo spent more than P418 million ($9.11 million) for her campaign, without anything coming from her personal funds. Her SOCE showed she received more than P423.16 million ($9.22 million) of contributions in cash and in kind. The Liberal Party contributed more than P16.87 ($367,714.37) million in cash. The Commission on Elections (COMELEC) has yet to release the names of her individual contributors as of press time. All candidates who ran for the national and local elections on May 9 were required to submit their SOCE to COMELEC, as stated by law. Outgoing Saranggani Representative and Senator-elect Manny Pacquiao remains the richest congressman, but this time, tied as a billionaire representative with Negros Occidental 1st district Representative Julio Ledesma IV. Based on his 2015 statement of assets, liabilities, and net worth (SALN), Pacquiao more than doubled his net worth to P3.26 billion ($71.06 million) from P1.6 billion ($34.88 million) the previous year. Boxing superstar Pacquiao, 37, had a megabuck fight with American rival Floyd Mayweather Jr. in May 2015, where the Filipino pugilist reportedly pocketed a whopping $150 million of roughly P7 billion. A huge chunk of it though goes to his promoted and training staff. Pacquiao, who reportedly owns seven homes including a mansion in his native General Santos City and another in Beverly Hills in the US, listed personal properties worth P1.7 billion ($37.03 million) and real properties worth P1.65 billion ($35.94 million). He stated to have liabilities of around P97 million ($2.11 billion). Coming in a far second was Ledesma, who had a net worth of P1 billion ($21.80 million), up P178 million ($3.88 million) from his P822 million ($17.92 million) net worth the previous year. While global growth is expected to slow down, the East Asia and the Pacific region will remain resilient, according to World Bank. World Bank decreased its initial forecast for global growth in 2016 from 2.9% to 2.4% due to sluggish growth in advanced economies, as stated in a report released on Wednesday. “Depressed commodity prices have slowed growth sharply in commodity-exporting emerging and developing economies, which are home to more than half the global poor,” said World Bank Group President Jim Yong Kim. Advanced economies like the US, European continent, and Japan are only expected to grow at 1.9%, 1.6%, and a meager 0.5% respectively. Commodity exporters are struggling in adjusting prices as oil prices continue to dwindle. Meanwhile, East Asia, including the Philippines, are some of the notable unaffected economies due to domestic demand, strong labor markets, and low energy prices. Consumers in the region are taking advantage of low oil prices, on top of the surge of public investment, and investor confidence.